Kristen got me thinking about diaries or ‘journals’ as we of journalistic integrity would call them. I did a quick basement dig through the bin of high school stuff. It contains all the important stuff that I knew would be needed in the future (like now when I haven’t had time to work on some drawings-in-the-works). Scanning through my journals I’m surprised at the lack of doodles and drawings. I appear to have been spending most of my efforts on actual writing since, I guess, that’s how I envisioned myself at the time. 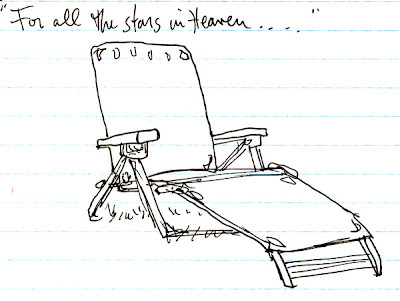 This standard webbed aluminum chaise lawn chair drawing was found in my journal for my public speaking class in the spring of my senior year in high school. The quote is, of course, from Queen’s “Long Away”. This entry was posted in 1980s, aluminum lawn chair, chaise lounge, drawings, lawn chair. Bookmark the permalink. Very nice early work…pretty deep for a high school kid.